Is your orchard bursting with fresh fruit? Damsons, apples, and pears galore! Most of the time fresh fruit goes to waste, simply because there is too much of it to eat. This year why not make the most of your harvest and make a delicious pie or preserves for your friends and family? Heat the oven to 180/ 350 F / Gas Mark 4. Whilst your oven is warming up start to prepare your fruit. Peel and core your Bramley apples and slice them into equal segments (roughly 8 segments per apple). Remove the stones from your damsons and chop them up into small pieces. For additional flavour (and mainly for experimental purposes) I have also thrown into the mix a deliciously sweet Spartan apple. Chop the Spartan apple into tiny pieces and mix with the damsons. You don’t want your fruit to be too juicy, because this may cause your pastry to go soggy when being cooked. Cover 2 flat baking trays in kitchen role and then place the trays on top of the cooking oven; this will help to dry out the apples slightly. Don’t worry if they start to brown, they need to be cooked anyway! Place the damson and Spartan apple mix into an everyday cereal bowl that has been lined with kitchen roll. Use an extra piece of kitchen role and dab the fruit ever so slightly to soak up some of the excess juice. Making shortscrust pastry is easy! Sieve the flour into a large mixing bowl, making sure there are no large clumps and add the butter. Using your fingertips mix the flour and butter in a sprinkling motion until the mixture takes on the consistency of bread crumbs and has turned a soft golden colour. Add the water (preferably into the centre of the mix) and kneed into a ball. If your pastry mix won’t stick together, then you will need to add a touch more water. Wrap the pastry in cling film and place in the fridge to chill for 25-30 minutes. Make a cuppa and take a breather. Once your shortcrust pastry has been chilled, take it out of the fridge. Before you roll out your pastry you will need to divide the mixture into two parts; a section for the pie’s lid and a section for the pie’s base. For the lid of the pie I separated just over 1/3 of the pastry. Dust your kitchen surface with a light coating of flour. Using a Joseph Joseph Adjustable Rolling Pin, roll from the centre of your pastry outwards to produce an even distribution. You should aim to make your pastry at least 5mm thick all over for an even bake. Once you are happy with the thickness of your pastry carefully place it inside your 23 cm deep pie pan, gently pressing it into place around the edges. Trim any excess pastry off that is dropping over the rim of the pan. If at any point you tear a hole in your shortcrust pastry, don’t worry, it can easily be patched up with the excess. Mix your sugar and cinnamon together in a mixing bowl. Take a handful of the sugar mix and sprinkle a thin layer over the base of your pie. Now it’s time to start adding the filling. For the base layer use an even distribution of Bramley apples, then add a handful of damson mix to sit on top. Coat your first layer with a sprinkling of the sugar mix. Keep repeating this process until you have filled your pie to the brim. Roll out remaining pastry to create your lid. 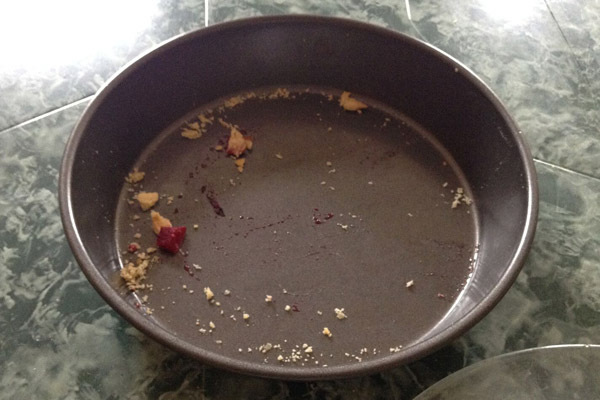 Carefully place the lid on top of your mounded fruit, making sure you don’t rip any holes in the pastry. If you find that you haven’t rolled out enough pastry for it to reach the edges of your pie, don’t worry! Simply fold in the outer edges of your pastry and pinch together with the lid. Make slit marks in the top of your pie to allow air to escape whilst cooking. Then add yet another sprinkle of sugar on the top of your pie. Bake for 30-35 mins, or until your pastry turns a golden colour. Damsons can be slightly sour, even when cooked, so feel free to serve your pie with a scoop of vanilla ice cream or creamy custard to take the edge off. As you can see from the evidence above, your work colleagues will love it! 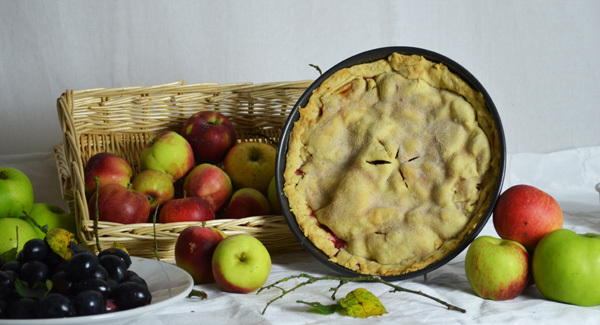 Apple Pie, baking, Baking Equipment, Bramley Apple and Damson Pie, Damson Pie, Orchard Fruits, Pie, Shortcrust Pastry. Bookmark.